The Joint Center’s Leading Indicator of Remodeling Activity (LIRA) provides a short-term outlook of national home improvement and repair spending to owner-occupied homes and is benchmarked to national spending estimates from the Department of Housing and Urban Development’s American Housing Survey (AHS). The latest LIRA release projects national spending for home remodeling and repairs will grow to $317 billion in 2017, an increase of 6.7 percent from last year. 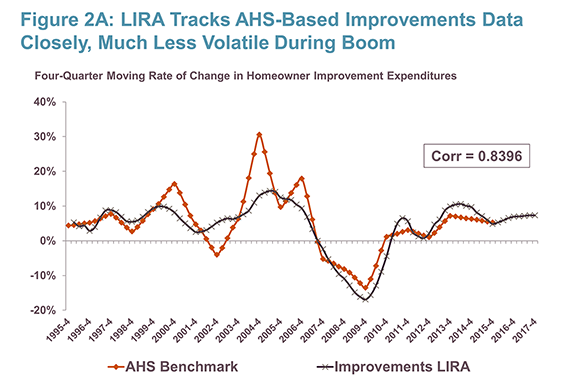 This LIRA release also updates and revises historical spending levels and growth due to the incorporation of newly released historical benchmark data from the 2015 AHS. 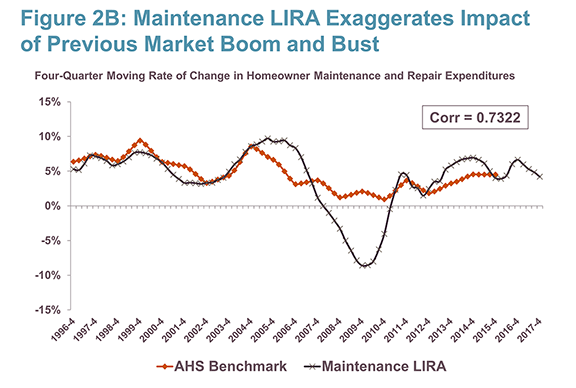 Compared to last quarter’s LIRA release, the updated LIRA now shows lower and less cyclical growth in homeowner improvement and repair spending in 2014 and 2015, a somewhat lower market size estimate, and also more modest projections for remodeling market growth in 2017. According to Joint Center tabulations of the AHS, spending in 2014 and 2015 was not quite as robust as the LIRA model predicted, growing 11.3 percent from $250 billion in 2013 to $278 billion in 2015 compared to LIRA estimated growth of 14.3 percent over this time period. As seen in Figure 1, the lower growth in remodeling spending in 2014 and 2015 has implications for the size of the market projected by the LIRA model for 2016 and 2017. Notes: Data for 2014 and 2015 are based on estimates from the 2015 American Housing Survey. Data since 2016 are modeled by the LIRA. Source: Joint Center for Housing Studies. Previously, the LIRA estimated a homeowner improvement and repair market size of $305 billion in 2016 and projected spending growing to $326 billion by the third quarter of this year. Now with the replacement of AHS-based benchmark data for previously modeled benchmark estimates, the LIRA model indicates remodeling activity reached $297 billion in 2016 and projects spending will reach $317 billion this year. The implication of slightly slower growth in actual remodeling and repair spending is a reduction in market size projections for 2017 of 2.9 percent or $9.5 billion. Incidentally, the more modest growth projected by the LIRA for 2017 compared to the prior release is not related to the addition of the new historical benchmark data. The LIRA projections revise routinely as the year-over-year trends in the LIRA inputs are updated or revised. The weighted average of the LIRA inputs produces the LIRA estimates and projections as seen in Figure 2A (for modeling improvements spending trends) and Figure 2B (for modeling maintenance and repair spending trends) compared to the now updated AHS-based benchmark data series for 1994-2015. The improvements LIRA continued to track the reference series very closely in 2014 and 2015. The estimates produced by the improvements LIRA model and the AHS-based benchmark now have a correlation coefficient of 0.84 (p-value of 0.00). And a simple regression of the LIRA output on the benchmark spending series results in an R-squared value of 0.6759, which suggests that upwards of 70% of the variation, or movement, in the improvements spending benchmark can be explained by the LIRA model. Sources: JCHS calculations using HUD, American Housing Surveys; Department of Commerce, Retail Sales of Building Materials; and US Census Bureau, Construction Spending Value Put in Place (C-30); Leading Indicator of Remodeling Activity. 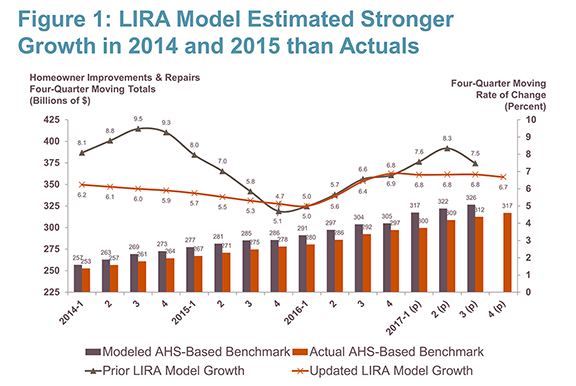 Similarly, Figure 2B compares the weighted average output of the maintenance and repair LIRA model to its AHS-based reference series. The maintenance LIRA has also tracked its benchmark fairly well since 2013. The maintenance and repair LIRA and its reference series have a correlation coefficient of 0.73 (p-value of 0.00) and a simple regression of the LIRA output on the benchmark results in an R-squared value of 0.5362, which suggests that about 54% of the movement in the home maintenance and repair spending benchmark can be explained by this LIRA model. Sources: JCHS calculations using HUD, American Housing Surveys; Department of Commerce, Retail Sales of Building Materials; and US Census Bureau, Survey of Residential Alterations and Repairs (C-50); Leading Indicator of Remodeling Activity. 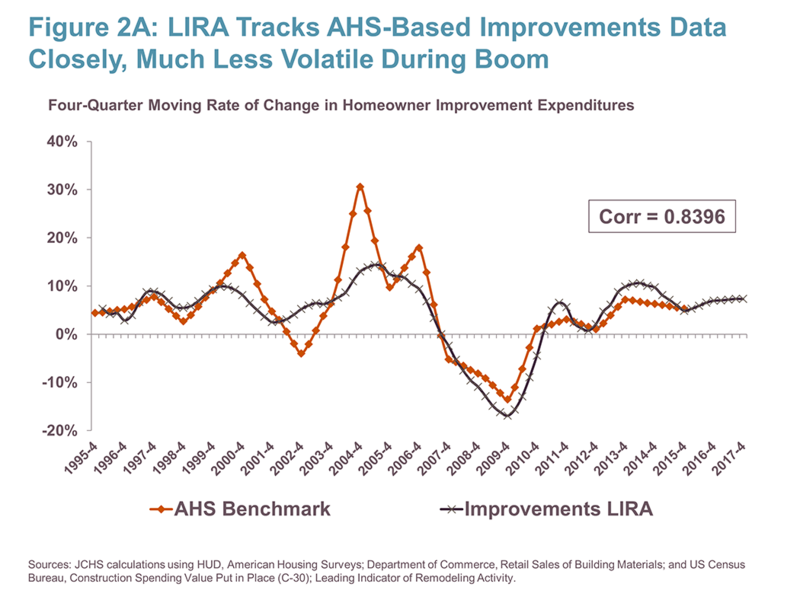 Last spring, the LIRA was re-benchmarked to a measure of home improvement and repair spending based on estimates from HUD’s biennial American Housing Survey, and at that time, historical remodeling and repair data from the AHS was available for 1994–2013. 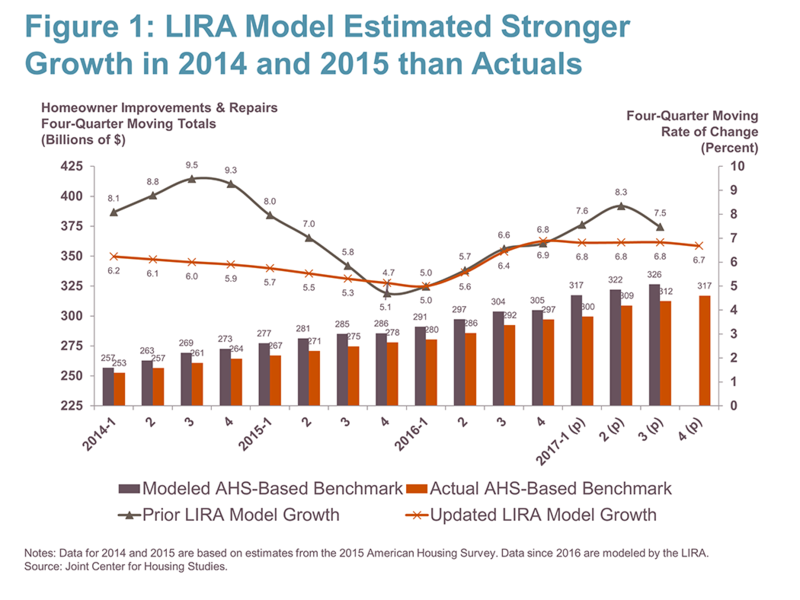 Until the 2015 AHS data became available, the LIRA model was used to estimate historical improvement and repair spending levels since 2013. Once every two years, with new historical AHS data, the LIRA benchmark series will be updated. With the January 2017 release, the LIRA model will be used to estimate historical spending levels since 2015 until the next biennial release of the American Housing Survey allows for actual 2016 and 2017 spending data to replace modeled estimates. More information and analysis of recent and expected trends in home improvement and repair activity will be forthcoming in the Joint Center for Housing Studies’ latest biennial Improving America’s Housing report to be released on Tuesday, February 28th.